You know how sometimes your memories don’t exactly align with reality? The best example I have of this is when my “boyfriend” in the 8th grade found out my family was headed to Michigan on a family vacation. He raved and raved about this playground there, Imagination Station; for days leading up to the trip I heard all about the giant playground and how fun it was. Of course, I defended his case, convincing my family we absolutely needed to stop there one way to check it out for ourselves. Imagine my disappointment when we arrived, only to find ourselves at a regular old playground, not unlike anything we had at home, and a place far too young for a thirteen year old to be climbing around on! 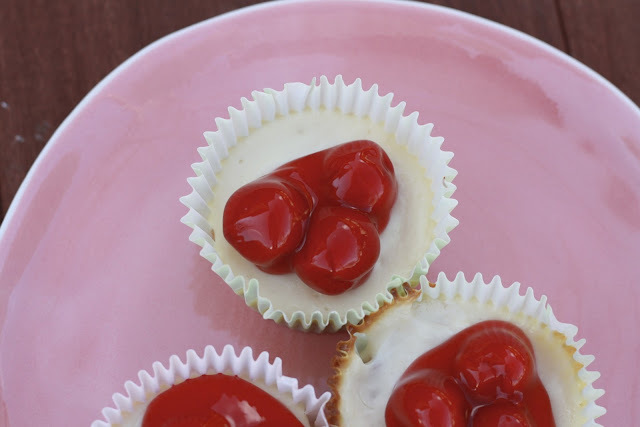 I kind of worried these cheesecakes would be like that. Of all the desserts my mom made during my childhood, a few stand out in my mind. Her sugar cookies, of course. Butterhorns. 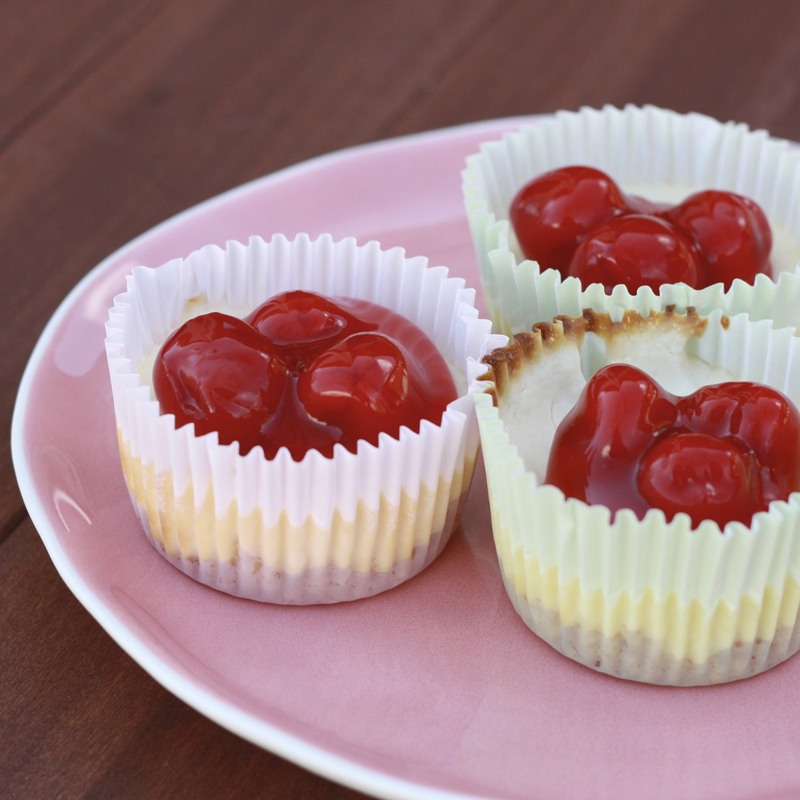 And these mini cheesecakes. I have vivid memories of absolutely loving these…but I couldn’t help but worry they’d turn out to be another Imagination Station. Thankfully, they were anything but a disappointing memory pulled from the past. Instead, one bite brought me right back to my childhood! They’re a great food for parties because they can be made ahead of time and no fork is required, just peel the wrapper off and dig in! I’m partial to the canned cherry filling, which looks pretty on top and nicely complements the creamy cheesecake, but you could easily top these with whatever you like! Any memories turned disappointing realities for you? Or resounding successes? 1. Preheat oven to 325F. Line a muffin tin with liners. In a small bowl, mix vanilla wafer crumbs and melted butter. Stir until combined. Press a spoonful of wafer mixture into the bottom of each lined muffin cup. 2. In a large mixing bowl, beat cream cheese, sugar, vanilla, and egg until smooth. Divide batter evenly among muffin cups. 3. Bake at 325F for 25 minutes. Place on a wire rack and allow to cool before removing from pan. Top with a spoonful of cherry pie filling (or other desired toppings) and chill, covered, until ready to serve.